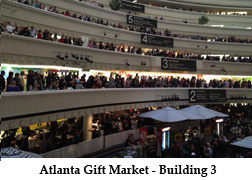 The 2012 gift market season started off with a bang with a significant increase in buyer attendance and order writing at the Atlanta Gift Market. The reason is that retail sales were up during the 2011 Christmas season and buyers hit the showrooms to restock their depleted inventory. And the increase in buyer attendance and purchasing continued with many of the following markets although not all were hopping like Atlanta. That is not too surprising because the high cost to exhibit at trade shows and the reduction in number of retailers makes it tough to support the abundance of regional shows. Instead retailers are traveling farther to the larger ones, purchasing over the internet, and depending on vendor sales reps to visit their stores. There are over 20 U.S. Gift Market shows in January and scads more throughout the year. The increase in spending during the Christmas season was mainly due to heavily discounted prices to entice consumers. However, this may not be a good marketing tactic in the long run because merchants may have to keep cutting prices as pointed out by Anne D'Innocenzio of Associated Press in "Retail group forecasts 3.2 pct growth for 2012." Retailers expect there will be a slow growth in the economy as it pulls out of the recession. They report consumers without jobs are cautious in spending while ones that have jobs have increased their spending. Online stores are growing rapidly but brick and mortar stores are still important avenues in selling merchandise. Products need to be aimed to where buyers shop and that there is a huge growth in emerging international markets. Learn more by watching a video of retail experts discuss "2012 Retail Trends and The Economy" on The Marketing Boutique website. So what does this all mean to the art licensing industry and property owners? 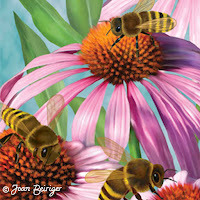 The sluggish economy is not out of the woods yet but agents and artists hope the increase in retail buying at the start of 2012 will mean an increase in licensing deals as more art is needed for more products. Artists should be aware of the kind of art consumers are looking for so that they can enhance their opportunities in getting deals by creating it. Or in reality what kind of art that manufacturers "think" consumers want. Read the following articles and view the videos to learn about the trends seen at six major 2012 gift markets. artist Joan Beiriger article "2012 January Atlanta Gift Market: surge in buyer traffic gives high hope to economic recovery"
agent Jim Marcotte of Two Town Studios article "Atlanta Tidbits"
Gifts & Decorative Accessories article "Direct from Market: Dallas"
Dallas Market Center article "Ground-breaking Dallas Market Signals Success in 2012"
Gifts & Decorative Accessories article "Direct from Market: Los Angeles"
Gifts & Decorative Accessories article "Direct from Market: Chicago"
Gifts & Decorative Accessories article "Direct from Market: New York"
Gifts & Decorative Accessories article "Direct from Market: Las Vegas"